Jan Hoyghen van Linschoten (Yahn Hoyggen van Lin’skoten), the son of Huig Joostenszoon and Maarietje Tin Henrixdochter, was born in late 1562 or early 1563 in Haarlem, Holland. In 1579, at the age of 16, he left Holland for Spain and Portugal. On April 8, 1583 he sailed for Goa from Portugal as a member of Archbishop Vincentius’ staff. He arrived at Mozambique, the Portuguese capital of the East African Company on the 4th of August. After 15 days spent reprovisioning, the squadron of four ships left for Goa and arrived there on the 21st of September. During his stay in Goa he acquired an intimate knowledge of the economy, and the military and political situation of Portuguese Asia, information that was of great concern to the Portuguese masters of Goa. Having lost his position on the Archbishop’s staff he left the colony November 23, 1588, and arrived at Ascension in May 1589. He returned to Holland in September 1592, after an absence of nearly 13 years. Four years later his Itinerario: Voyage ofte schipvaert van Jan Huyghen van Linschoten naar Oost ofte Portugaels Indien ... 1579-1592 was published. The first part was a detailed account of his travels, including his pictures and charts. The map of Mozambique, Insular et arcis Mocambique, shows the four ships of Jan’s squadron in the harbor taking on supplies. 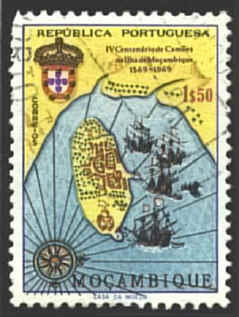 The ships fly the Portuguese flag and the Portuguese arms are in the upper left hand corner. 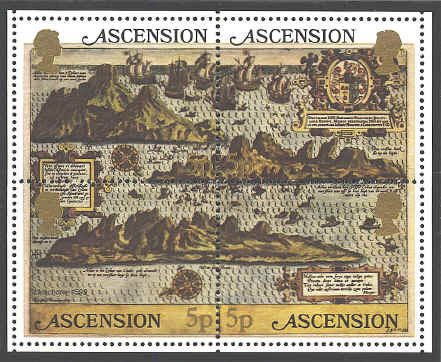 "The view of Ascension, The true description of the Island of Ascension leying under 8 degrees on ye south side of ye equinactiall lyne shows three separate views of Ascension, from the top, the southeast side of the island, the northeast side, and the northwest. It shows the swarms of birds and flying fish that provided a source of fresh food for the ships' crews." The view of St. Helena shows the northwest side of the island and Chapel [James] Valley. It was engraved by Raygnald Elstrake, and was published in England in 1598. The compass rose that shows the orientation of the picture has been moved from the left side to the right. A ship in the harbor flies the Portuguese flag. 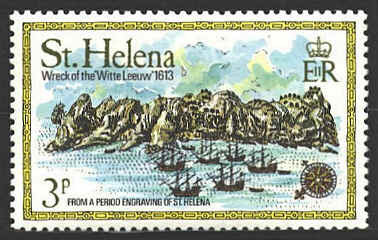 The stamp is part of a set issued in 1978 to mark the sinking of the Dutch East Indiaman, Witte Leeuw (White Lion) in 1613.